What is an RPA? What is a ‘bot’? What are downsides of traditional RPA? How can a decision-centric RPA can address those? These are the questions that we are going to discuss in this post. Despite all of the advances in technology, companies still have lots of manual tasks which are prime candidates for automation. Expensive staff hours are being consumed by simple data entry into Excel, reading emails, processing attachments, etc. In order to complete these tasks, multiple computer software programs like CRM, SAP and terminals are being used in conjunction with one another. These copy and paste values from one to the other, enter them into Excel for calculation purposes, make decisions and enter the outcome into other applications. What a waste of time and resources! Once RPA is implemented within a process, it allows computer software to do its job and complete the tasks for you. Some examples include invoice processing, purchase order or quote creation, on-boarding new staff, setting up the environment for new customers, etc. Most of these tasks and activities are mundane and repetitive. Therefore they are both error prone and time consuming. These exist in every organisation and across all processes, including back office, middle office and front office. There are many benefits of using RPA in your organization. Bots do not get tired and they do not need breaks. They simply follow instructions in order to complete the job. They work 24 hours a day and they will complete tasks without any mistakes. By automating repetitive tasks, organisations can save time and increase staff productivity and client satisfaction, and consequently decrease operational costs. This is all good until it is not good enough. The bots’ instructions require periodic review and optimisation. For new scenarios, business conditions, and policy and procedural changes, they should be updated and revisited. To make them reliable and up to date they need maintenance. They will also retire and often be redeployed. Based on industry best practices and Gartner advice, bots scripts should be reviewed every 4 to 6 months. This depends on how thorough the robot’s instructions are in the first place. For example, how easy is it to reuse part of the instructions for another bot? How bots can take decisions and follow business rules? How can bots can share decision knowledge around processing a task? These are the real challenges of RPA’s current technology, which if not addressed adequately will introduce massive technical debt in organisations down the line. Technical debts, like any financial debt, must be paid. Not by monetary means, but by time, resources and overall effort spent on a particular related area. Traditional RPA technology is not designed to let robots make decisions and cannot ensure that the bots follow business rules. When a traditional RPA solution is used for automating operational business decisions and following business rules, these become very convoluted. As it is ‘not a set and forget’ solution and requires constant review and monitoring, this will introduce massive technical debt within the organisation. If these issues with bots are not addressed over time, it will cause operational problems in running the business. For example, updating a bot’s scripts for a new type of customer might take longer and become more expensive than doing the job manually. Or bots may continue to do the job in the old way and therefore miss new steps. Or the bots are not aware of a new way of interpreting a situation in order to take appropriate action. 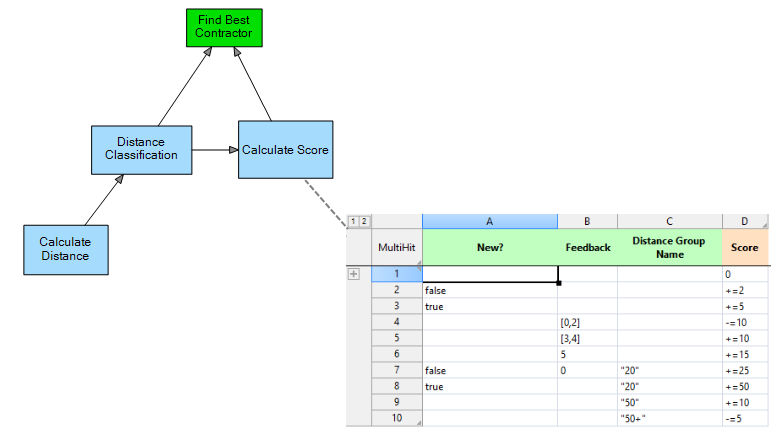 Decision-Centric RPA: a Robot’s decision logic model to find the best technician/sub-contractor for a job. As such, increasing the technical debt will defeat the purpose of RPA automation in the first place, which was to increase the quality of the completed job, increase the productivity of staff and reduce operational costs. At FlexRule, we have built a decision-centric RPA module on top of our existing decision-centric automation platform that addresses these challenges in order to reduce the technical debt backlog. Above all, it enables you to instruct the bots without introducing technical debt in the first place. Enabling robots to make decisions is not about technologies like AI, Machine Learning, Neural Networks, Predictive Analytics, etc. at all. Operational business decisions are a routine part of day-to-day jobs. Staff make decisions day in and day out while performing tasks and activities related to their jobs. Traditional RPA will introduce a heavy technical debt if it is used for activities related to operational business decisions which require decision-making or following business rules. Decision-Centric RPA enables robots to make decisions and follow business rules without introducing technical debt to organisations. 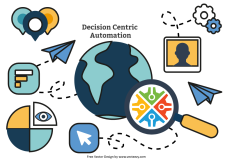 Decision-Centric RPA will introduce the decisioning capability into bot scripts, thereby empowering you to automate business decisions as part of task automation. That is a critical part of task automation and will not only avoid the technical debt, but also allow both robots and staff to share the logic for operational business decisions and business rules. Also, it enables your new workforce -the bots- to make the right decisions.